Bloomsbury is a small part of London nestled between Holborn, Clerkenwell and Soho. 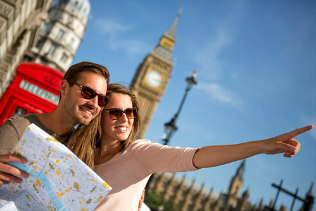 However, for its size, it has some of London’s most iconic buildings and attractions. There’s the British Museum, Sicilian Avenue, Kingsway with the Savoy Hotel, and you’re right next door to amazing buildings like the Royal Courts of Justice, the Inns of Court and the glitzy lights of Soho. You certainly won’t be short of things to do in this area, even if all you’re after is a quiet stroll around the quaint squares (such as Bloomsbury Square or Red Lion Square) situated between old townhouses, or some fabulous shopping or a drink in a tucked away pub. Our one must-do activity for people visiting Bloomsbury isn’t the British Museum, which is amazing but pretty well known, but instead is Coram Fields, which spans seven acres over Bloomsbury and Holborn. This is the site of Thomas Coram’s Foundling Hospital, which was essentially an orphanage with a spectacular history and was the subject of the novel Coram Boy by Jamila Gavin. This was turned into a play by Helen Edmundson for the National Theatre in 2005 and enjoyed enormous success. The hospital itself is now a museum and art gallery, and the Thomas Coram Foundation for Children still exists, and is one of the UK’s largest children’s charities. The list is almost endless. One particularly great little hidden gem is the Betterton Street Poetry Café, a café dedicated to poetry of all kinds, offering a regular series of readings and recitals, but also a great place to get a coffee and leaf through the many poetry books and magazines. If you’re a poetry fan, there can be no better place! It’s also the home of the Poetry Society. There’s also the Cartoon Museum (near the British Museum) and the lovely little bookshops and boutiques situated along the little streets south west of the British Museum. This is quite an intellectual and educational part of London, and there’s also a great deal to do by way of nightlife, so we really recommend taking a look at our Bloomsbury hotel booking service to see what great deals we’ve got for you at one of our many cheap hotels in the area. Come to the British Library and you’ll be standing in one of the country’s most expensive public buildings. Some must sees during your visit include the world famous Magna Carta and the Diamond Sutra, which is the world’s oldest dated printed document. You’ll soon spot the unusual octagonal tower of St Pancras New Church. If you take a peek inside you will see some beautiful Victorian stained glass windows and the Ionic colonnade. If you love architecture you should stroll along Woburn Walk, a beautifully preserved typically Dickensian Georgian terrace here that was designed in 1822 by Thomas Cubitt. W.B Yeats lived at number 5 between 1895 and 1919, and wrote some of his greatest poetry during this time. It makes sense to explore the history and wider meaning of medicine whilst staying in Bloomsbury, so you should come here to the brand new Wellcome Collection museum. You will find three ever changing exhibition galleries here, as well as the world famous Wellcome Library. This delightful neoclassical building is University College London’s Main Building, that was designed by William Wilkins and built in the 1820’s. It’s open to the public so you should come here, if only to see the temporary art exhibitions in the Strang Print room held by London’s most famous art school the Slade. You’ll see the likes of Rembrandt and Turner here too! Come face to face with skeletons of long extinct animals and try out the Grant Museum of Zoology. This is the only remaining museum of zoology in London and it’s piled high with skeletons including those of the Dodo and the Thylacine (an extinct wolf). In amongst thousands of pottery fragments at the Petrie Museum of Egyptian Archaeology you will find amazing antiquities such as the oldest dress in the world worn by an Egyptian teenager in 3000 BC and the beautifully decorated coffin of Nairytisitnefer from 750 BC. This museum is a little gloomy in some corners so it’s a good job that the staff provide torches! If you’re looking for a quiet sanctuary you should come here to gardens of Gordon Square. Famous past residents include John Maynard Keynes, Lytton Strachey and Virginia Woolf (who lived at number 46 between 1904 and 1907). No visit to Gordon Square would be complete without stopping off at the massive Church of Christ the King. This early English Neo-Gothic church is actually a grade I listed building. It’s famous for having no tower! Head to the church basement here and you will find a room filled with ceremonial cloaks, one of which is reserved for the return of Jesus Christ. Visit the School of Oriental and African Studies and you can see the temporary exhibitions of photography, sculpture and art that take place at the Brunei Gallery. Afterwards you should check out the secluded roof-top garden at this building. This hugely impressive art deco building is known as Senate House. It’s actually the University of London’s library and one of the first skyscrapers to be built in London between 1927 and 1936 by Charles Holden. This large and orderly square, Russell Square, is the largest square in Bloomsbury and one of the largest in London! You’ll find the huge Victorian terracotta fancy that is the Russell Square Hotel here. The square’s gardens make a great place for a picnic and you can grab a drink from the cafe. Tavistock Square was laid out by Thomas Cubitt in the early part of the 19th century. You will see a statue of Mahatma Ghandi in the gardens here. Although number 52 Tavistock Square no longer exists, this is where Virginia Woolf lived whilst she wrote greats like To the Lighthouse and Mrs Dalloway. Fancy some shopping? Then spend an afternoon at The Brunswick. This entirely unusual sci-fi looking 1960’s Grade II listed shopping centre houses a number of high street stores and Skoobs, one of the best second hand booksellers in London. Hidden in The Brunswick you will find the Renoir Cinema which is perfect place to retreat to if you fancy watching French films at one of London’s most popular arthouse cinemas. London film buffs love it here! The Foundling Museum and more.. The Foundling Museum recounts the story of the now demolished Foundling Hospital in Bloomsbury, which was set up by Thomas Coram as London’s first home for abandoned children. One of the hospitals founding governors was William Hogarth who set up an art gallery at the hospital –you will find an impressive art collection here too, including the works of Gainsborough and Reynolds. If you’re bringing your children to Bloomsbury you should take them to Coram’s Fields, the former site of the Foundling Hospital that has now been transformed into a wonderful 7 acre inner city park complete with playgrounds and a pet’s corner. Just be aware that adults aren’t admitted without children! This is Queen Square, often dubbed ‘hospital square’ because of the multitude of hospitals that are based here. In the gardens you will find a statue of Queen Charlotte who was the wife of King George III. You should also visit The Queens Larder pub, which is apparently so named as this is where Queen Charlotte used to store food for King George III when he was treated for mental illness in the area towards the end of his reign! One of the UK’s most famous hospitals, Great Ormond Street Hospital, stands here. This is the only specialist children’s hospital in the country. Lamb’s Conduit Street and more.. If you love browsing through boutiques you should come here to Lamb’s Conduit Street. Lined with independent shops, cafes and restaurants, this street has a real air of diversity and eccentricity for you to discover. No shopping trip here would be complete without a stop of at The Lamb – one of London’s finest old pubs which still contains Victorian snob screens. These are made of cut glass and pivot at head height so that gentlemen in the lounge could block out the working class drinkers in the bar! Here stands the Charles Dickens Museum, which is situated in the only former London home of Charles Dickens to remain intact (he lived in 15 different places in London!). Charles Dickens moved here for 2 years in 1837, during which time he wrote famous novels including Nicholas Nickleby and Oliver Twist. You’ll find letters, manuscripts and first editions from the famous author here, as well as the earliest known portrait of Dickens painted by his Aunt in 1830. Here is Bloomsbury Square which is surrounded by delightful Georgian buildings. It was originally laid out in 1665 and was the first of London’s open spaces to actually be called a square! The gardens here are open to the public, so you can relax here. All bookworms should explore Museum Street and Bury Place during their stay in Bloomsbury. You’ll get the chance to experience the real charm of the area whilst browsing the second hand and antiquitarian bookshops here. The British Museum is one of the great museums of the world and as it’s situated here, in the heart of Bloomsbury, you must go! There are over 2 ½ miles of galleries, 70,000 exhibits and the largest collection of antiquities, prints and drawings housed under one roof. You’ll never see it all in one day so you should attempt to visit the highlights such as the Round Reading Room, the Rosetta Stone, the Egyptian Mummies and the King’s Library. Alternatively you could book a guided tour. Before or after a trip to the British Museum you should take a peek at the bizarre antiquitarian books displayed in the windows of Jarndyce Booksellers opposite. If you love cartoons then you should take time out to visit the Cartoon Museum. You can see the best of British Cartoon Art throughout the ages here, as well as the best of Comic Art including Rupert the Bear, Dan Dare and the Bash Street Kids. As St George’s Church (originally built by Nicholas Hawksmoor between 1716 and 1731) has been wonderfully renovated in recent years, this is a must-see in Bloomsbury. It has a really unusual steeple, which actually resembles a stepped pyramid, with a statue of King George I on top. This is the only statue of this non-English speaking monarch in Britain! Come here to Bedford Square and you’ll be standing in Bloomsbury’s handsomest square surrounded by attractive Georgian houses. Very little has changed here since it was built in the 1770’s, making this square a perfect example of 18th century uniformity and symmetry. It was here at no 7 Bedford Square that Britain’s best known art movement – the Pre-Raphaelite Brotherhood – was founded in 1848 by Rossetti, Millais and William Holman Hunt. Sicilian Avenue is, technically speaking, a cut-through between Kingsway and Vernon Place, but there are cut-throughs and there are cut-throughs, and this is a special one. With a mix of neo-classical and classical Italian architecture very much in mind, the short street boasts majestic columns, Romanesque archways and detailed stonemasonry running up the walls between the residential flats either side. They’ve also managed to squeeze a few trees in there! And don’t forget the cafés. Kingsway is a main road running from Aldwych and on towards Russell Square, but refers mainly to the stretch outside Holborn Station. We’ve made it an attraction because of the sheer amount of stuff there is to do along it, not to mention the curious, Dickensian backstreets and the wonders they hold. Red Lion Square is a small green area located on the eastern side of Proctor Street lined on three sides by enormous Edwardian houses and containing some fun little nuggets of activity. The square contains a bust of the famous philosopher Bertrand Russell, has a café, and on its south western side borders The Square Pig, an upmarket but friendly restaurant and bar. Located, unsurprisingly, on Betterton Street, this quaint café is the home of the Poetry Society and offers visitors a great coffee, a relaxed atmosphere and, predictably, a massive source of poetry. Whether you’re after books, journals or magazines, the upstairs café and its downstairs space are your poetic home in London. There are also readings, talks and events.